Made with air frozen breast fillets and a few simple storecupboard ingredients, this unusual dish makes a great lunch or supper. Serve spooned over noodles or plain boiled rice in shallow bowls. Pat the chicken dry on kitchen paper. Cut into small cubes and season. Melt the butter in a large frying pan, add the chicken and fry gently for 4-5 minutes, or until beginning to colour. Add the onion, chilli and sugar to the pan, and fry for a further 3 minutes. Pour in the coconut milk and stock and bring to a simmer. Cover and cook gently for 10 minutes, or until the chicken is cooked through. Check that the juices run clear and there is no pink meat before serving. Add the frozen spinach to the pan with freshly grated nutmeg to taste and stir in gently. Cook for a further 5 minutes, stirring frequently, until very hot. 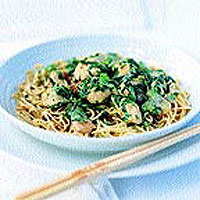 Season to taste and serve spooned over rice or noodles, with the coriander leaves sprinkled over the top.